UBC Library is launching Visualizing the World: A Maps and Geographic Information Systems Speaker Series this fall. The first talk, scheduled for October 26 at 11:30 a.m. in the Dodson Room at the Irving K. Barber Learning Centre features a talk by cartographer Anton Thomas. 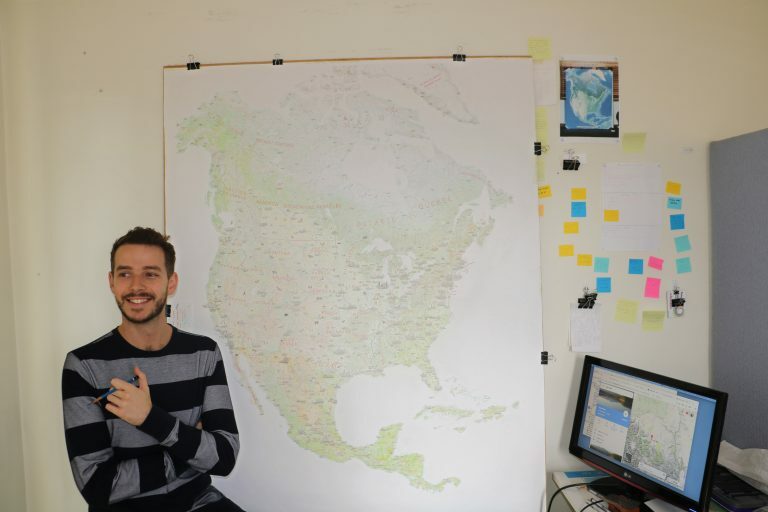 Three years ago, Anton picked up a set of color pencils and began drawing North America. State by state, city by city, he wanted to pay tribute to this vast and beautiful continent by way of pictorial map. Without any idea how long it might take, he stumbled into an extremely dense and lengthy project: The North American Continent. Now, three years and 600 cities later, it is on the verge of completion. In this presentation Anton will explore methods, techniques and the story behind the map – including its peculiar origins right here in Canada. We will take a tour of the map, unpacking its contents while examining some of the interesting dilemmas one comes across in such a project. 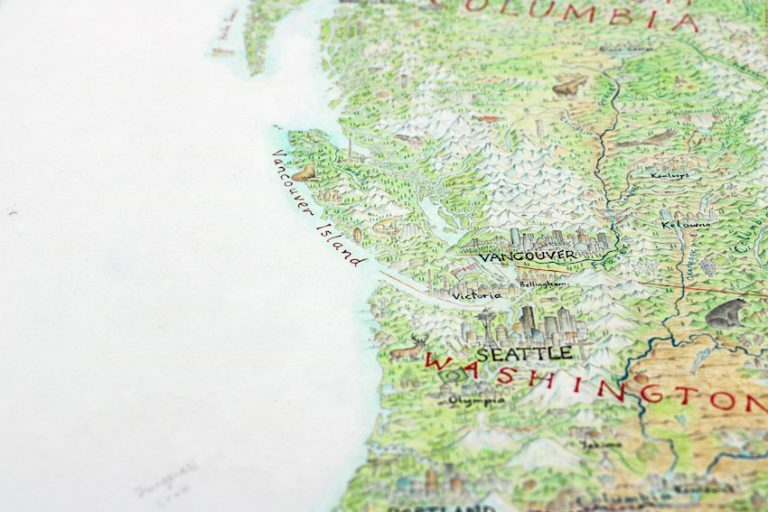 Selecting content for an expansive pictorial map is a thrilling but windy road – a search for harmony between the creative freedoms of art and the geographic truth of cartography. Hand-drawn maps are less common than they once were, but their aesthetic qualities are as evocative as ever. Even for those who do not feel they excel at drawing, picking up a pencil is a great way to further connect with a visual task. This presentation will explore and demonstrate a range of techniques Anton has developed over the years drawing pictorial maps. With a particular focus on pencil (color and lead) and fineliner pens, he will look at sketching, layering colors, linework, materials and tools, projections, maintaining geographic accuracy and more. He will also include some practical ideas on connecting further with the region you are mapping, whether through music, film, food or otherwise – especially useful when traveling to the region is not possible. To feel more absorbed in the character of a place assists the creative process and has many positive spinoffs. After all, no amount of research can quite tell us what a place feels like. By using our senses as a guide, we can access something of its experiential character – hugely valuable for any cartographer. Anton Thomas is a cartographer and artist based in Melbourne, Australia. Using primarily color pencil and fine-liner pen, he specializing in hand-drawn pictorial maps. For the past three years he has been drawing an extensive map of North America filled with a diverse range of content, including almost 600 cities and towns. Each of these are composed of real skylines and landmarks. Inspired by several years he spent traveling the US and Canada, this map: The North American Continent, was featured on National Geographic’s Best Maps of 2016 and is on the verge of completion.